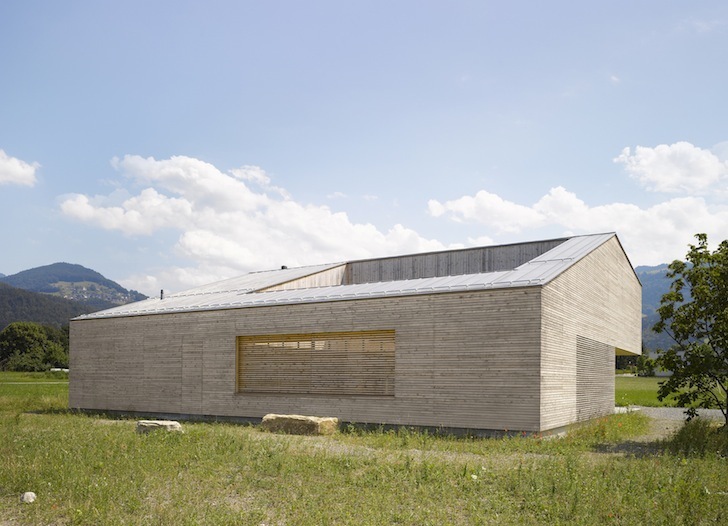 Bernardo Bader boldly went where no other designers have gone in the Vorarlberg region of Austria, where most homes are cubed, plain and lack privacy. 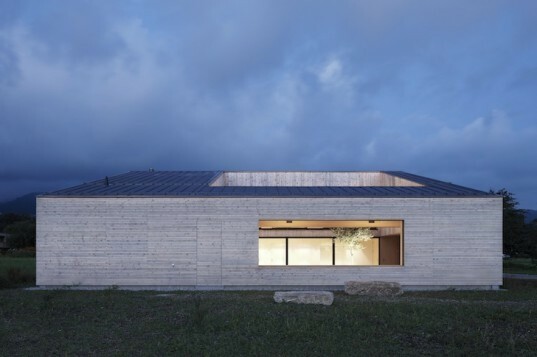 Counteracting this boring sameness, he designed a charming home with ventilating louvers and moveable cutouts for a family living on a small plot outside of Sulz village. This dainty timber dwelling is wrapped around a central courtyard that has a tree which can grow right through an open roof. Just 500 square meters, the plot on which this single family dwelling was placed lies between existing development and a green belt that is surrounded by heavily trafficked areas. In such an environment, a bit of privacy goes a long way, as does a good, healthy natural aesthetic. Which is partially why Bernardo Bader opted to place the home’s green lung away from public view. A double storey home with most of the public functions located on the lower level, the timber house has an upper terrace that is wrapped around the green courtyard. Most of the private areas are also directed to this refreshing space, making it both the home’s lung and green heart. The slatted facade promotes natural ventilation and floor to ceiling glazing allows plenty of daylight to reach all corners of the home and solar gain to keep it warm in winter. Bader has deviated from the cubic norm with a home that is both refreshingly green and features plenty of privacy!